In the past three decades, almost 4,000 planet-like objects have been discovered orbiting isolated stars outside the Solar System (exoplanets). Beginning in 2011, it was possible to use NASA’s Kepler Space Telescope to observe the first exoplanets in orbit around young binary systems of two live stars with hydrogen still burning in their core. Brazilian astronomers have now found the first evidence of the existence of an exoplanet orbiting an older or more evolved binary in which one of the two stars is dead. Almeida is currently a postdoctoral fellow of the Federal University of Rio Grande do Norte (UFRN), having conducted postdoctoral research at the University of São Paulo’s Institute of Astronomy, Geophysics and Atmospheric Sciences (IAG-USP), where he was supervised by Professor Augusto Damineli, a coauthor of the study. Clues followed by the researchers to discover the exoplanet in the evolved binary called KIC 10544976, located in the Cygnus constellation in the northern celestial hemisphere, included variations in eclipse timing (the time taken for each of the two stars to eclipse the other) and orbital period. “Variations in the orbital period of a binary are due to gravitational attraction among the three objects, which orbit around a common center of mass,” Almeida said. 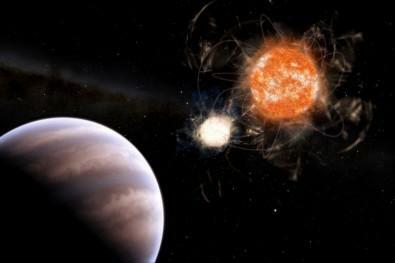 Orbital period variations are not enough to prove the existence of a planet in the case of binaries, however, because binary stars’ magnetic activity fluctuates periodically, just as the Sun’s magnetic field changes polarity every 11 years, with turbulence and the number and size of sunspots peaking and then declining. To refute the hypothesis that variations in the orbital period of KIC 10544976 were due only to magnetic activity, the researchers analyzed the effect of eclipse timing variation and the magnetic activity cycle of the binary’s live star. KIC 10544976 consists of a white dwarf, a dead low-mass star with a high surface temperature, and a red dwarf, a live (magnetically active) star with a small mass compared to that of our Sun and scant luminosity due to low energy output. The two stars were monitored by ground-based telescopes between 2005 and 2017 and by Kepler between 2009 and 2013, producing data minute by minute. FAPESP will invest US$40 million in the GMT, or approximately 4% of the telescope’s estimated total cost. This investment will guarantee 4% of the telescope’s operating time for studies by researchers from São Paulo State (read more at: agencia.fapesp.br/28569). “We’re probing 20 systems in which external bodies could show gravitational effects, such as KIC 10544976, and most are only observable from the southern hemisphere. The GMT will enable us to detect these objects directly and obtain important answers on the formation and evolution of these exotic environments, as well as the possibility of life there,” Almeida said.